Weather finally cooling down - but the gaming isnt getting less hot! First on the board in the Biffervatory as it has now been named was Skull and Roses. Biff, Gary, Jon, Ash and Jim introduced Alex to the club with this excellent game that is rapidly becoming a favourite starter game. Jim won his first game of the night, showing no mercy to the newcomer. 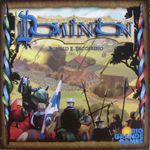 Next game to hit the table was Dominion. a favourite of Johnny, who played with Nathan (welcome back! ), Iesytin, and Bobby. Meanwhile in the front room, Matthew taught a group of players new to the game how to be murderous pillaging Vikings. David, Jenny, Jim, Dan, and Gary were all eager to learn the game. Matt taught it well enough that Jim won the game, with Dan coming second when the game broke up into three teams of two. A night at the club doesn't seem complete recent;y without a game of Terra Mystica on the go, and this evening was no exception. Unusually it was four player who had all played before that got together Kevin, Dave, Paul and Will played Dwarves, Chaos Magicians, Mermaids and Nomads respectively, a collection of some of he stronger races in the game. Dave started the game going backwards in a big way, whilst the rest of us tried to leave him behind. This tactic was unsuccessful and the magicians scored a runaway success. The Mermaids finished last somehow despite sharing he longest series of linked settlements with the magicians. 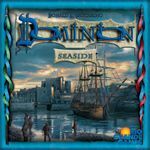 When Dominion ended the players decided to compare games with Dominion Seaside, and so embarked on another round of deck building on holiday! Iestyn won this game too! The conservatory/Biffervatory players reached out Hunters and Gatherers after Skull and Roses finished. This game gave Alex his first win at the club! After a time farming in Hunters and Gatherers, the biffervatory players decided to go crossing hte river in Dragon Delta (locally known as bridges!). Ash won the game, helped by the other players concentrating on taking down the leader and not paying attention to second placed Ash. After the second game of Dominion Bobby had to leave so the three remaining players (Iesytn, Johnny and Nathan) had a rumble with this game. Johnny won over the three rounds of this game. 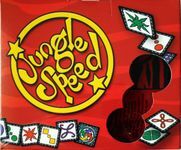 The Biffervatory players, Biff, Ash, Alex, Jon and Jam, after crossing the Dragon Delta, had a reaction speed check with Jungle Speed. 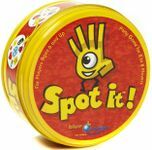 The game was won by Biff, with whom the other players wouldn't play another round! Was this because he won too easily of because he plays rough? The readers want to know! After the empire building of Terra Mystica, Dave, Paul, Will and Kevin tried their hand at speed empire building. In a close game Paul won by 1 point. For the second time in one evening Jungle Speed made an appearance, this time in the front room with the Eketorp players. As a frequent player of the game, Jim won this one, in a group of young, faster players. The front room gang played Dobble after finishing with Jungle Speed. David, Jenny, Matt, Dan, Jim and Gary had another reaction speed check event. The other twin Dan won this one. Iestyn taught Nathan how to play Tyrus. He must have taught him well as Nathan won both games that they played ! Nathan joined Johnny, Ash, Alex, Gary and Jon in a round of seven wonders in the Biffervatory (without Biff). Alex won the game, with Ash second who was deliberately trying to lose the game!!! 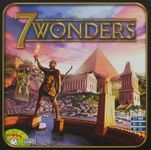 One wonders why you would want to lose at 7 Wonders (pardon the pun)?? The front room saw some Mafia bloodshed in Family Business, which Jenny won easily. Paul taught Iestyn and Kevin how to play Hanabi, and as new comers a lot of help was given to them on how to play. The game however went well and 23 out of 25 was scored. The last game of the evening was Jenny, David, Matt, Dan and Jim play gold mining dwarves. In the final round Jenny and Dan were the saboteurs, although David was kept locked down! The three rounds were won jointly by Matt and Dan with 6 gold each. 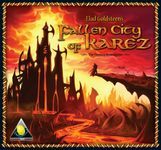 The conservatory was taken over for the Fallen City of Karez. This took all evening, but was very well received. The main room was initially split into a couple of 2 player games of this new filler which is becoming a favourite at the club. Paul taught and beat the newbie Steve, twice! 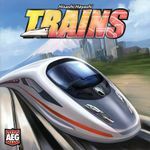 The other game in the main room was the freshly opened copy of Trains. Steve, taught Gary, Johhny and Alex and used a card heavy, train light strategy to win. After Trains, Paul and newbie Steve joined us to play Power Grid. Using the Central Europe board, that is heavy in coal and nuclear free in parts. Paul fresh? off his wins at Eight Minute Empire carried on winning by rushing to 15 cities, albeit only powering 13. His power plants being limited shall we say. Gary who was undefeated at Power Grid, came a woeful last. We finished off with a 5 player Eight Minute Empire. This was very tight with 2 players finishing with 12 pts. Fortunately, for me I had 2 coins left and won the tie-break over Gary. Paul's run of sucess finished with a last place, I just like to point out. 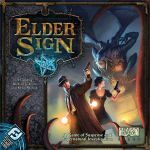 The front room started with Elder Sign and they declared that it was a cake walk. 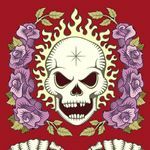 We have subsequently found out (Through the Elder Gods who are displeased) that through some poor rules explanation or just plain cheating, they were giving themselves a big advantage. All I know about the other room was this was played to much cheering.